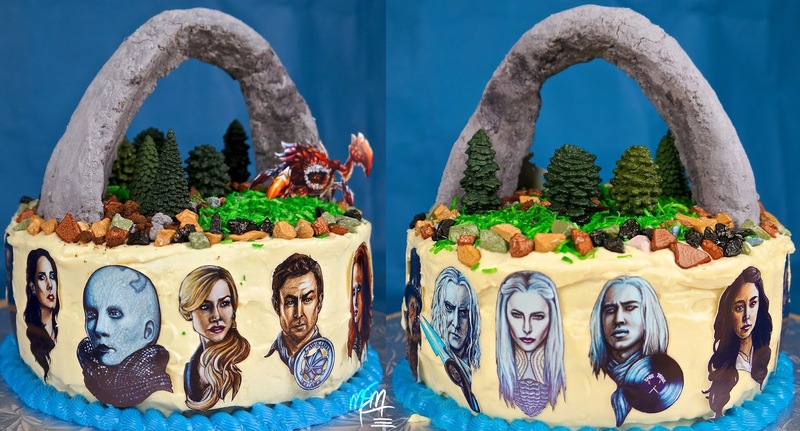 This tutorial is more of a how-to on how to turn any cake into a Defiance theme. 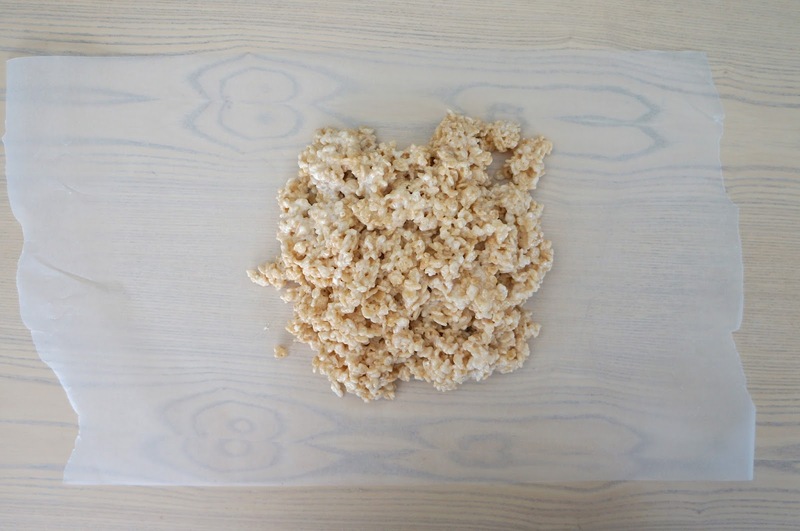 Using rice cereal, marshmallows, and butter, make rice krispies mixture as recipe directs. Let the mixture cool slightly before moulding. Work on a piece of wax paper or parchment paper to avoid sticking. You might also want to spray your service/ hands with something like Pam. Mould into arch shape no wider than your cake. Make sure to tightly compact the rice cereal together. 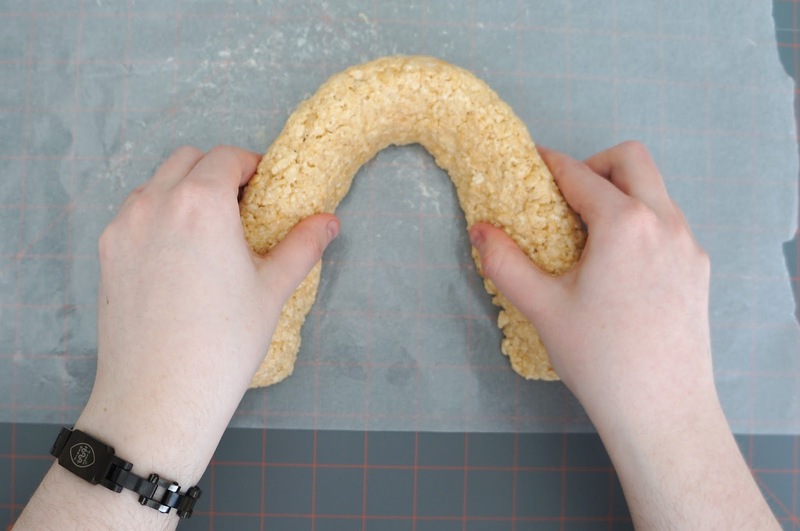 As the mixture cools further, stand the arch up and refine your arch shape. Don't worry about sharp edges/ detail, you'll be carving it more later. Place sculpted arch into refrigerator to harden. Once the arch has hardened, carefully use a sharp knife to refine arch edges and add the cut out piece on the one side. If necessary, place back in refrigerator to re-harden. Melt your chocolate/ candy melt mixture to achieve desired grey colour and apply to arch. Once covered, place back into refrigerator to cool coating. Once the arch has completely cooled, cut skewers to desired length (at least 1" into the arch and 1" into the cake for stability) and stick them into the bottom of the arch ends. 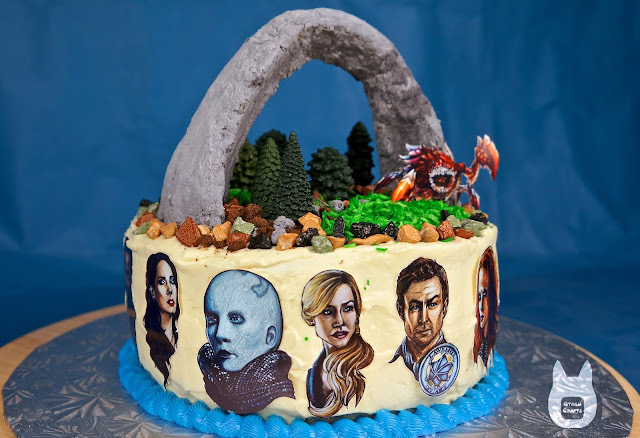 Place the arch onto your already iced cake. Crumble chocolate cookies into small pieces to create boulders and dirt. Sprinkle onto cake surface around the arch in desired locations. 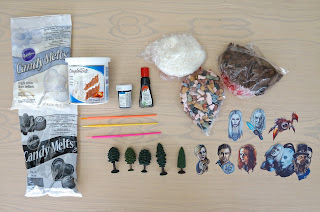 Dye your shredded coconut with some green food colouring for grass. Add coconut around the arch. Also add chocolate candy rocks. Stick small plastic trees into the top of the cake. If you want you can also cut out pictures to decorate the top and sides. Add any additional piped icing decorations that you wish (ours has a blue icing border around the bottom). 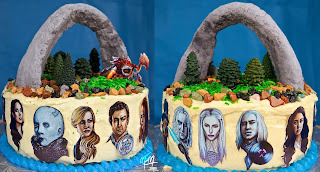 Now you have your finished Defiance cake!